What happens when 88 affordable apartments join thousands more less affordable apartments coming to Capitol Hill? This summer, 88 affordable apartments will be up for rent at a prime 12th and Pine location. But given Capitol Hill’s 97%+ occupancy rate, you will have to act fast if you want a shot at moving in this fall. 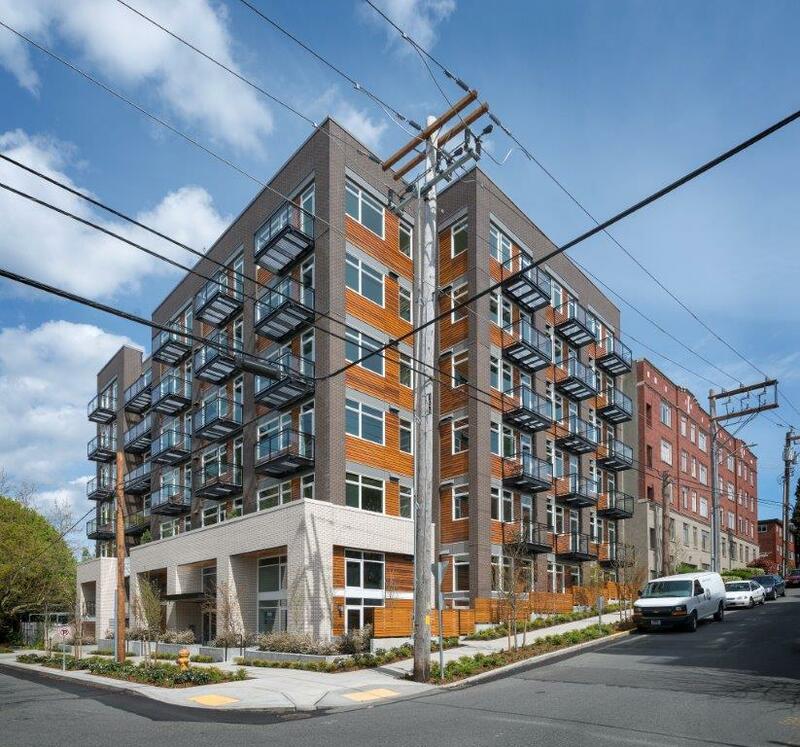 Leasing information went live this week for the below-market units that will make up the affordable housing component of Capitol Hill’s unique 12th Avenue Arts project. Leasing appointments can be made starting June 9th. Capitol Hill Housing is managing the units, adding it to the nonprofit’s substantial stock of affordable housing around central Seattle. “We expect demand to be brisk based on interest from the general public we’ve received to date,” said CHH’s David Dologite. The first come, first served apartment units are reserved for those with household earnings no greater than 60% of the area median income, putting max income eligibility in the ballpark of $29,000 $37,000 for a single person and and $53,000 for a four person household. Full-time students are excluded. There are 8 studios that will rent for $817 a month, 72 1-bedrooms that will rent for $883 a month, and the 8 2-bedrooms that will go for $1,031 a month. The rents appear to be significantly less than market-rate apartments on Capitol Hill. In March CHS reported that the median priced Capitol Hill studio listed on Craigslist was renting for $1,000 a month. Along with the apartments, 12th Ave Arts will features spaces for performance, retail, offices, and community gatherings. Construction on project will continue throughout the summer, with an expected opening date of September 30th and a grand opening slated for later in fall. U:Don Fresh Noodle Station is slated to be part of the building’s restaurant and retail offerings. Thanks in part to lots of community engagement, affordable housing is a key component of both 12th Ave Arts and the Capitol Hill light rail station development, two of the most prominent projects underway on Capitol Hill. CHH is now poised to manage units in both as it recently made the shortlist to develop one of the station’s affordable housing properties. CHH was also selected to submit a separate proposal to become a master developer of the project along with a New York-based Jonathan Rose Co. While the affordable units will be a welcomed addition to the neighborhood, they’ll be a drop in the bucket compared to the thousands of market-rate units currently under construction around Capitol Hill. A report from real estate analysts Polaris Pacific (PDF) showed some 600 apartments under construction on Capitol Hill and in “Central Seattle” as of last month, although the report doesn’t detail the building count — or how it defines “under construction.” CHS reported that there were around 2,500 Capitol Hill units under construction in March, spread across 27 buildings including projects that were about to break ground. Across the entire city, the Polaris report shows 7,366 apartment units under construction and 4,414 apartment units approved — given our count, you can assume there are many more coming. UPDATE 6/9/14: We heard back from Polaris and you might want to file the map above under untrustworthy navigation. “We consolidated this list by reading through articles from the Puget Sound Business and Seattle Times as well as from blog posts from Curbed Seattle and neighborhood blogs,” a Polaris representative tells CHS. Their roster includes only five Capitol Hill projects: Hollywood Lofts, Lexicon, Stream Belmont, 1650 East Olive, Sunset Electric Apartments, and REO Flats. The list is missing hundreds of coming units on E Pike alone. Meanwhile the 6-story, 70-unit Stream Belmont at Belmont and Republican is complete and ready for move-ins. The building owners promise a “contemporary, yet contextual aesthetic.” CHS previously reported on the landowners rocky path to developing the project. And lest Capitol Hill’s older buildings get swallowed up amid the new development boom, upgrade to the neighborhood’s building preservation rules are in the works. The Pike/Pine Urban Neighborhood Coalition is holding a meeting with City Hall officials Thursday evening to discuss changes to the developer incentives that attempt to save character structures and facades in Pike/Pine. This entry was posted in News, etc. and tagged 12th ave, affordability, development by Bryan Cohen. Bookmark the permalink. 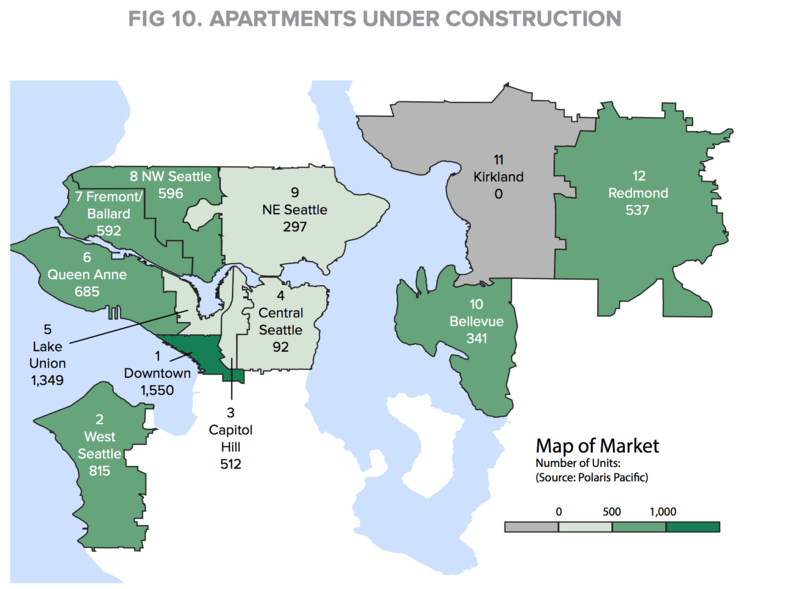 Also, why the discrepancy in “units under construction” on Capitol Hill? Polaris Pacific says 512 but CHS reported 2500 in March. Thanks, Calhoun. The number of new affordable units coming on the Hill is very limited — most aren’t on Hill. Here’s an example. I’ll need more time for a definitive count — but it will be a boring report. There just aren’t any non-market rate projects in the neighborhood. The discrepancy we should have handled better so I’ve updated the paragraph you reference. Polaris doesn’t define “under construction” or its terms like “future” so we don’t know what parameters were used in the report. We do know it’s easy to count many more units by just looking at the map we published in March and adding up the permitted units. There are more than 500 units alone under construction along E Pike and E Union alone. We’ll ask Polaris to explain the count. Assuming they used the same method across the city, the map is still useful to show relative intensity across the city. It’s certainly true that most of the new buildings are and will be market-rate, but there are some that will be “affordable”….the 12th Ave Arts and the light rail development come to mind, and also all the apodments. When I say that Capitol Hill does have quite a few affordable apartments I am referring not only to new buildings, but also to existing ones, which I mentioned in my last comment (and also including all the apodments). If you do decide to pursue this issue further by tallying up the total number of affordable units (compared to the total of all units), the number should include existing buildings as well as those to be available within the next few years. If it is indeed a “drop in the bucket,” I will then admit that I was mistaken. The underlying issue here is that there is an official definition of affordable based on percentage of median income; the market rates that usually work best for people at the median income or above; and then the rapidly increasing decline of housing for people who fall in that range between. The building I’ve lived in for the last 10 years was recently sold to a company that (based on previous purchases) will likely repackage the property for development. The resulting new construction building will likely not be affordable for me–not to mention my elderly and artist neighbors–all of whom have too much income to qualify for affordable housing, but considerably less than what is expected for the new “market rates”. To have the vibrant and diverse community we love on the Hill–we need to figure out how to maintain housing stock for people across the housing spectrum. I understand the financial incentives for property managers to offer ‘equal housing’ but from the tenant’s perspective, who earns under $29k and can afford a brand new two bedroom apartment on the Hill (let alone a new 1 bedroom)? I can’t imagine these places being anything cheaper than the older 1910-1960’s apartments scattered about and those are still not affordable 2 bedroom scenarios for under $29k’rs. It’s like anything else. “Affordable” is a pretty subjective term. Used here I think it basically means “less than market rate”. Even if they went for 1/2 the market rate they’d still be out of reach for a lot of people in Seattle. It just underscores the obvious– Capitol Hill rents are out of reach for a lot of Seattleites. It’s not realistic to see and great number of programs designed to make a high-rent area like CH affordable to everybody. According the city of Seattle office of housing rent and housing income limits. 60% income limit is actually $37,080 now as a liveable income is considered about $64,000 a year within the city limits. Thanks. I updated with the correct income limits. I had outdated census numbers. Apologies for the mistake. No worries, I only caught it because i just had to look up the information myself. get real hipsters live in undiscovered areas and have to share space with others to save money (I’m not telling). tired of this idea you are entitled to live in Cap Hill for $500.